The passenger in the viral picture was seen at Dulles Airport in Washington, D.C., where U.S. Ebola victim Thomas Eric Duncan had a layover. 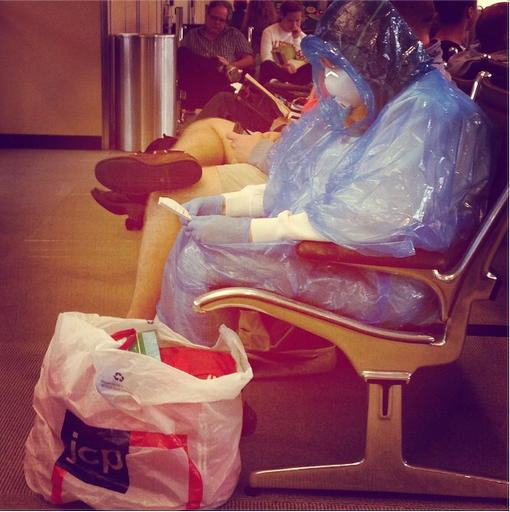 A picture of a female passenger at Dulles International Airport decked out in a homemade hazmat suit, including a full-body gown, mask, and gloves, has gone viral. The photo of the woman at the Washington, D.C., airport was first sent to The Daily Caller and was covered by multiple news outlets and tweeted like crazy. Thomas Eric Duncan, the first U.S. Ebola patient, had a layover at the airport last month while flying to Texas from Liberia. He died on Oct. 8. But health officials said Duncan was not symptomatic during the flight, so passengers were not at risk for catching the virus. Dulles, plus airports in Chicago, Atlanta, and Newark, New Jersey, have begun screening passengers for Ebola. Live Updates: Ebola In The U.S.